A real quick post this evening for the current Clean and Simple Sunday Challenge. This is a fabulous sketch. I don't think this could have been any easier for me. 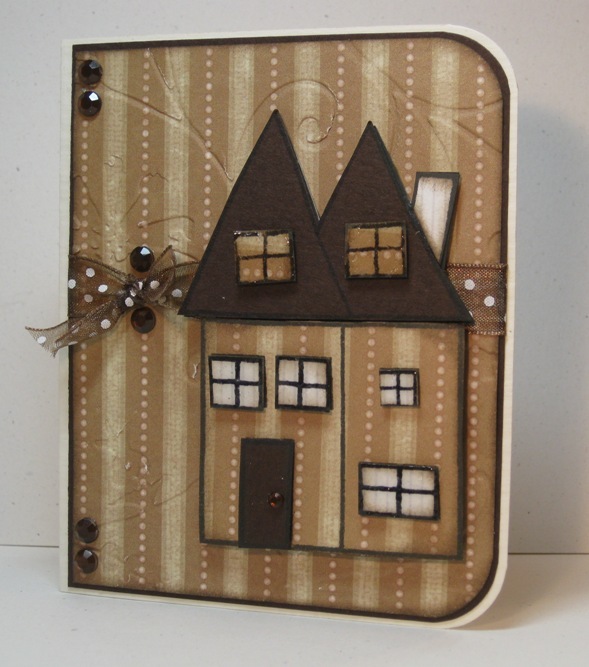 I layered brown cardstock and a single sheet of 8 X 8 designer paper from DCWV-The Far East Stack. 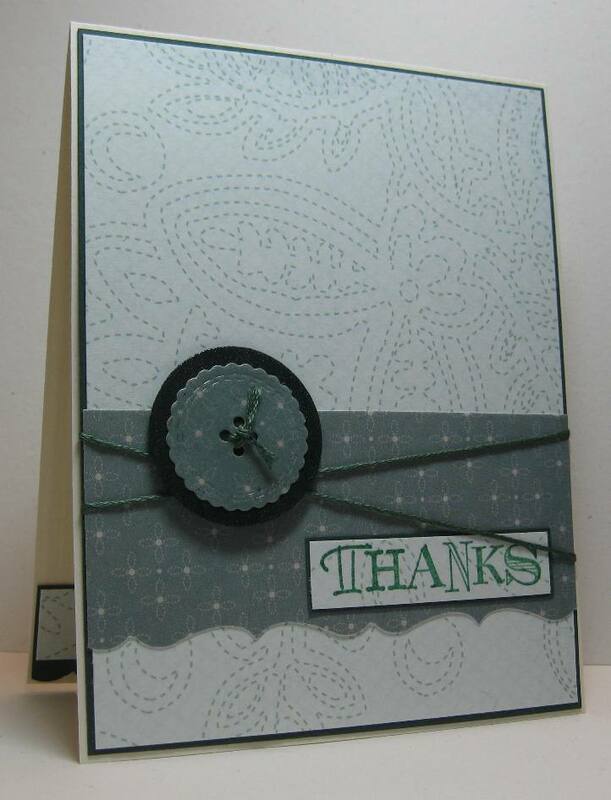 I finished with a simple Thank you from the Fiskars So Much Thanks set. I popped each of the layer up with foam tape. I love this designer paper, the print on it is fabulous. 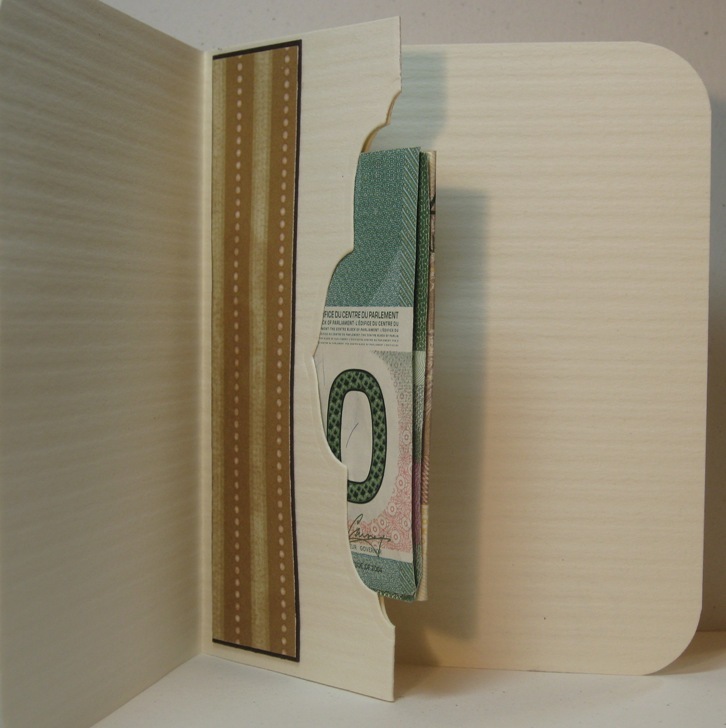 Supplies: Cream and brown cardstock, Designer Paper-DCWV-The Far East Stack, Fiskars-So Much Thanks. A new week and a new Mojo Monday, and a fabulous new sketch. Today’s card seemed to flow very nicely. Supplies: Cream and brown cardstock, Designer Paper-ColorBok, Paper Inspirations-Birthday Calligraphy, Fiskars-Cherry wood Lane, Sizzlets-Buttons, Misc dotted ribbon. 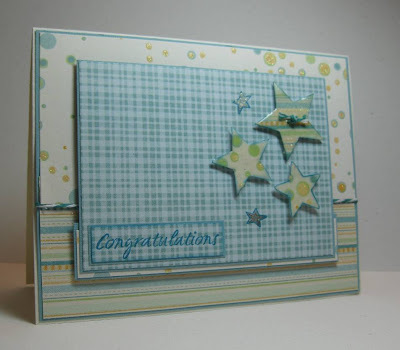 A quick post to sneak in my card for the Clean and Simple Sunday Challenge. This is a great sketch, I love it. Supplies: Cream and deep sea green cardstock, Designer Paper- DCWV, Fiskars-Simple Stick, Sizzlets-Buttons, misc embroidery floss. My oh my.. I am posting a Clean and Simple card today, I however did not make it so simple. In fact I don't even want to try to guess how much time this card took me. This is for a new baby boy. In typical Nina fashion the picture does not do the card justice. In truth the part that took me the longest was making the stars. I cut them out from a stamped image, trying to resize as I cut. I have odd shaped stars all over my craft space. I embossed them all with clear embossing powder and made one into a button. 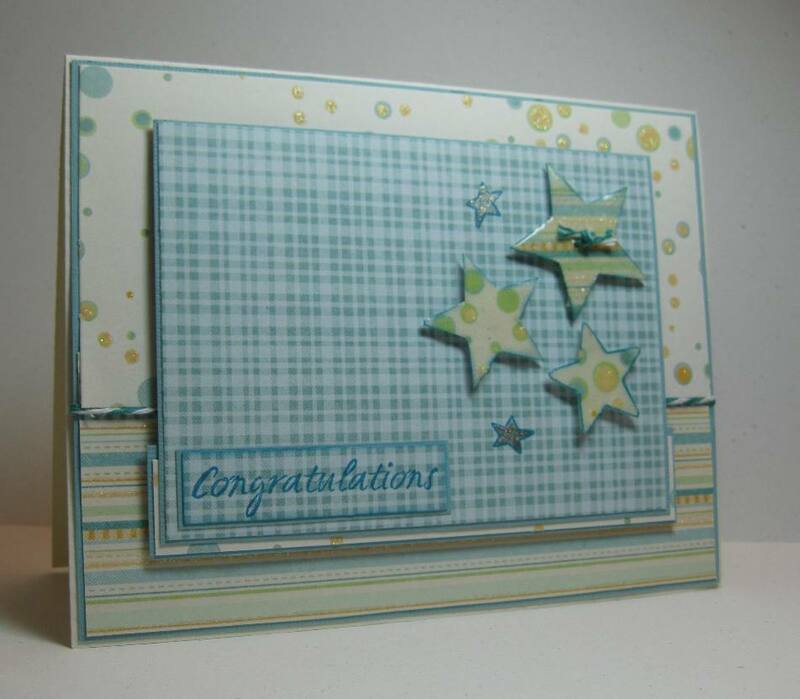 The two tiny stars I stamped on the DP directly and coloured then with a Clear Star jelly roller. 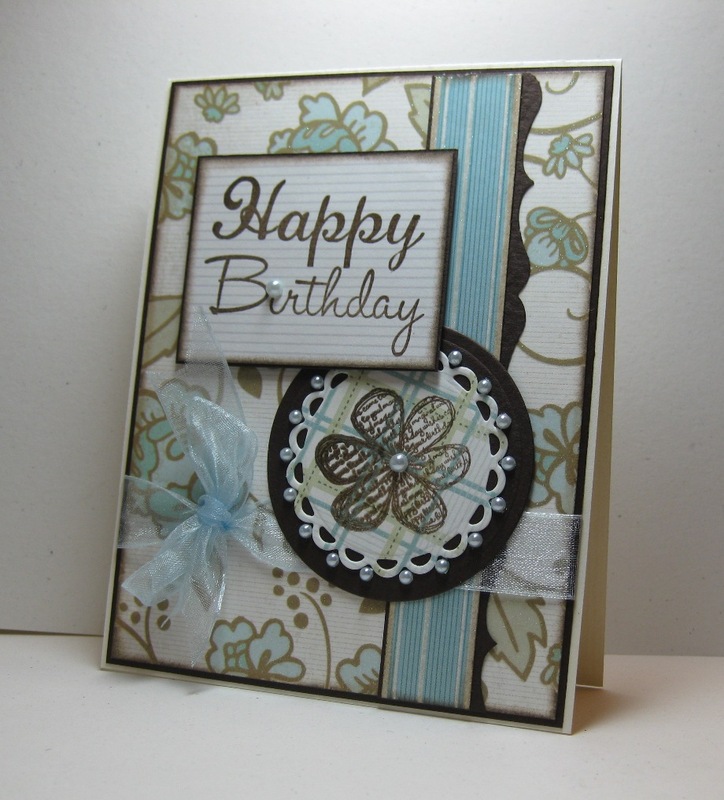 Supplies: Cream and blue cardstock, Designer Paper-DCWV, There She Goes-Bit of Stardust, TPC Studio-Brush Stroke Greetings, Sew Easy fancy floss, Gelly Roller-Clear Star. The sun is out, and it is fabulous. While a good portion of Canada has high temps, we in Victoria have seen gloomy days. This morning as I did my morning trek to work in the chilly.. yes chilly, morning air I was mentally grumbling. The days seem shorter, the sun going down a little earlier and not waking up as early and I feel that Mother Nature is not being over friendly to us. We are missing out a little on what I would normally call summer. Enough negative grumblings, I have high hopes for a long summer well into October. I needed a little gift card holder for a party we are attending this weekend, I adapted from a cute little card that Kim Teasdale gave a tutorial on last fall. This one is a little bigger but still a nice size at about 3 1/2 by 4. The picture does not show all the layers that I used to make the house, I love how this turned out. In the end the group decided on money rather then a gift card (Ikea wanted to charge $11 for shipping it). I put a $20 bill in there to test :). I embossed the DP with a Cuttlebug folder to add texture. The windows all have Diamond Glaze on them to give them a glass look. 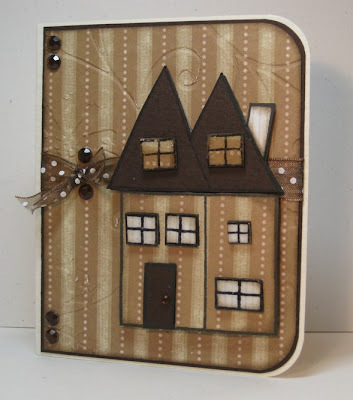 Supplies:Cream and brown cardstock, Designer Paper-Recollections, The Stamps of Life-houses4us, Recollections gems, misc ribbon. Wow, I can't believe I have not posted in so long. In truth, I have not been on the computer or crafting much in weeks. I would love to say I have been doing wonderful things but I don't have a clue where the time went. Enough of that, I did manage to try Mojo Monday this week. I have not been feeling all that creative the past little while so I am not sure I am totally happy with this card but I am not disappointed either. Supplies: Cream and brown cardstock, Designer Paper-DCWV, Fiskars-Birthday Cheer, Hot off the Press-Magical Birthday, Spellbinders Nestabilites, EK Success bracket border punch, AMuse pearls, misc ribbon. Happy Anniversary to my wonderful, amazing, fabulous husband. I love you to bits :). 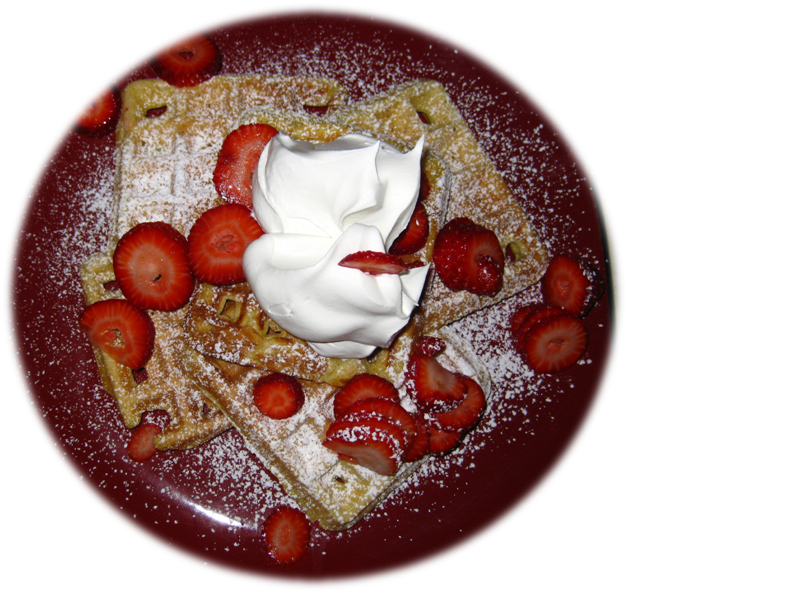 I made his anniversary card a couple of Mojo Monday's ago so I won't repost but this was breakfast this morning. We have been having some fabulous summer weather, and usually I would like to be outdoor enjoying it. This evening though, I just wanted to lock myself in with my craft supplies. With that said, it may be why I added a couple items to a Clean and Simple card. This is for the Clean and Simple Sunday Challenge #16. 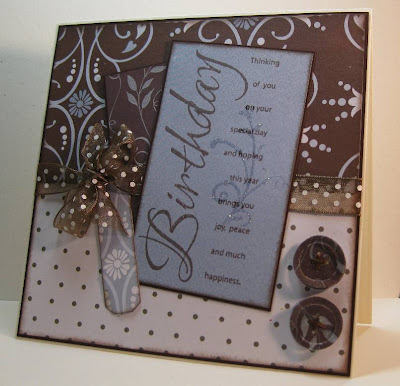 My sister Barb also made a card for this challenge, hop on over to take a peek at her take on this challenge. I started with stamping designer paper with a Thanks stamp multiple times in olive. It took me forever to find a image I wanted to use for my focal point, in the end I am happy with my choice. 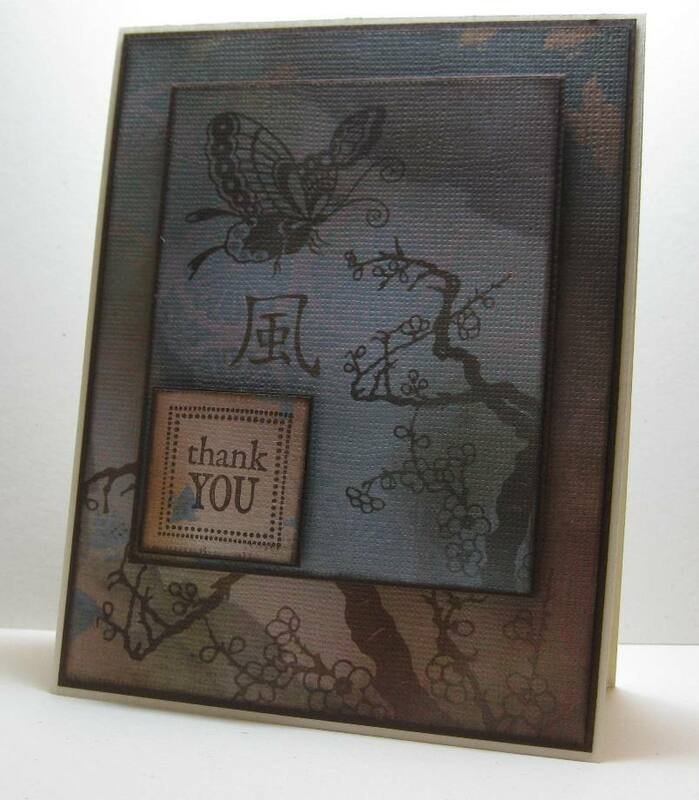 I stamped the image with Versamark then olive to emobss it with clear embossing powder. 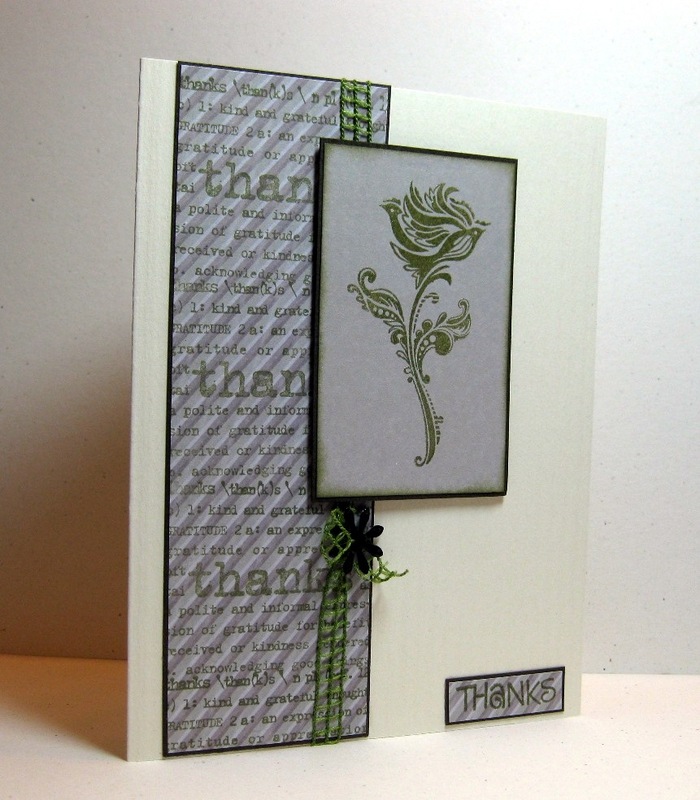 The small thanks is also embossed, I finished with a small punched and a embossed flower and ribbon. Supplies: Cream and Olive cardstock, Designer Paper-K&Company, Stampin' Up!-Lexicon of Love, The Stamps of Life-Coffee4two, Inkadinkado-Mindscape Fall, Smal flower punch, Clear embossing powder, misc mesh ribbon. Happy 4th of July to all my American friends, I hope that you had a fabulous holiday weekend. 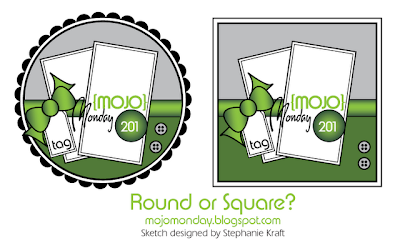 What a great sketch this week for Mojo Monday :) I had such fun making this card, it is for a friend who I have not seen in awhile. I think I will send her this as a reminder it is time we get together. I knew I wanted to do something TEA themed and I love how it turned out. I added little bits of sparkle all over, it is a shame it does not really show up in the photo. 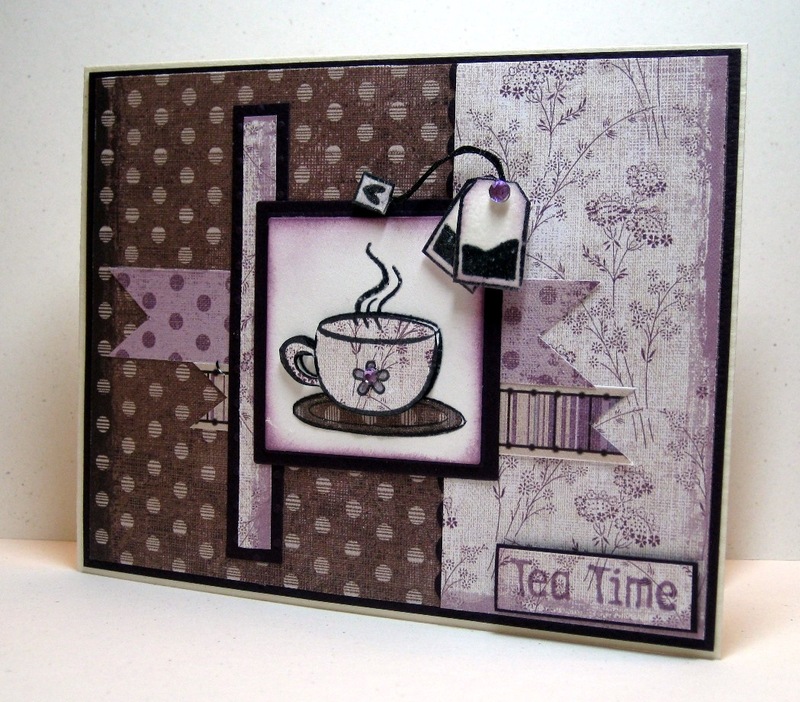 I stamped the tea cup three times then cut out the parts to give it dimension, I did the same with the tea bags. I did emboss the tea bags as well to give them gloss. I used my Spica glitter markers for the rim of the cup as well as the small flower in the centre and the heart tag at the end of the tea bag string. I finished with a couple of little purple gems. Supplies: Cream and Plum cardstock, Designer Paper- Hot off the Press, TPC Studio-Coffee Cafe, Kaiser Craft gems. Just a quick Challenge post for this evening. I made this card Friday but I was just to lazy to get a picture taken. We had a fabulous sunny weekend here and the great outdoors called to me. 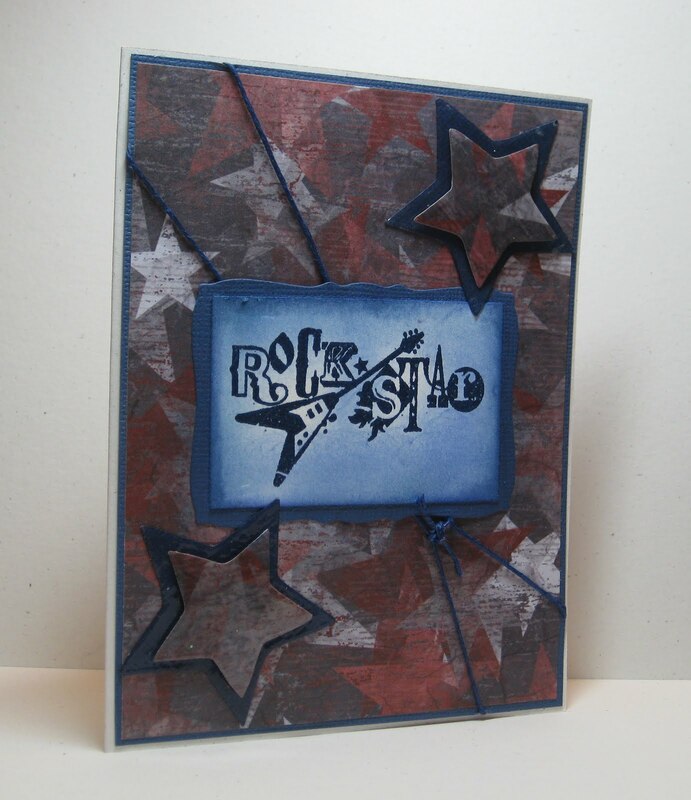 I know I am cutting it real close for this challenge from Cards for Men, the theme..Stars.